I was embarking on yet another journey and thoughts of fear and failure were not far behind. I didn't want to be the girl always trying but never succeeding. I didn't want to be the person always pursuing an ever distant dream. I wanted to be the woman on a mission taking steps toward purpose. I have had several businesses in the last few years and not all of them have been successful. Actually none of them have been successful. I've sold items on Ebay such as event tickets, shoes, computer parts, fur jackets and made a nice chunk of cash but it was always far and few between sales. I once attempted to launch my own online store, nothing sold. Not one item. I once tried to sell gift baskets to companies as gifts for their employees. My mother was the only one to purchase a basket. I sold energy services, insurance products, cosmetics and the list goes on. I've always wanted to be a business owner. Being your own boss, setting your own schedule, establishing a mission for the company and executing it has always appealed to me. However as I embarked on this journey of becoming a blogger and YouTuber I was honestly fearful. What if the vision I saw didn't attract any views? What if the content wasn't good? What if? But then again what if the vision I saw attracted viewers? What if the content was really good? What if I were successful? I believe what makes this business idea different than others is that I'm not trying to prove the concept as I'm launching it. I'm using my writing and speaking skills to share things that are important to me. With other businesses I had to acquire new skills that didn't come naturally or study a new area I had no experience and really no desire to learn. As fear drew near I really weighed my options. I thought about the pros and cons to launching a blog as a business. Another fear I had was that I would run out of content to create or share. That somehow I wouldn't have enough to keep up with the demand. As time passed and it did, months went by and I still wasn't sure if this was what I wanted to do. During this time I found several podcasts from other bloggers, YouTubers, writers, speakers, actors that really encouraged me. 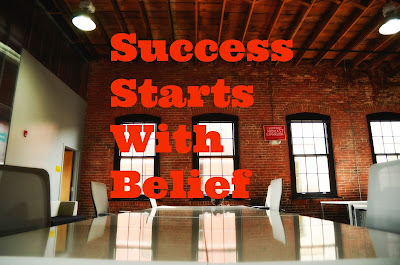 The over arching theme in all the episodes I listened to was that "Success Starts with Belief". They all shared their journeys and how it all began and person after person stated that they believed they could make money at this. They believed that could work as a full-time blogger/writer/speaker/YouTuber so they pursued it. It all started with a belief that this was something that they could do. I can totally relate because as much as I was fearful of failure I had a feeling deep inside that I could actually make a living writing. I really believe that there are people in this world that want to read and watch the content that I create. When I think about the possibilities of what I have on the inside of me it's really mind blowing. I don't know who this post is for but don't give up on your dreams. Keep pursuing what you see in your mind. Keep creating the reality that you want. It's all possible you just have to believe. I hope you enjoyed this post and that it inspired you. Thanks for stopping by and as always thanks for reading! !